The dust from the Spring/Summer 2014 collections has barely settled and already a new spate of castings and go-sees is underway for the editorial and campaign season that will determine which newcomers have true staying power. Over at Production at Art + Commerce a fresh crop of newly anointed runway stars brought a healthy dose of in your face beauty to the fore as they posed in the agency's stairwell. 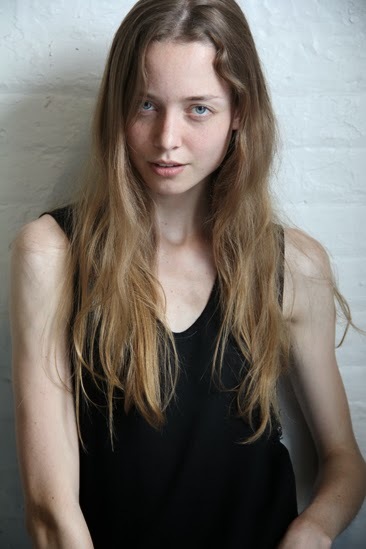 Relative newcomers Nicole Pollard, Dalianah Arekion, Lou Lou Robert, Hana Jirickova, and Tess Hellfeuer were joined by the Spring/Summer 2014 season's standout rookies. German Anna Ewers is destined for greatness having already been cast by Production at Art + Commerce in Prada's Resort 2014 campaign lensed by Steven Meisel. The charming and larger than life personality Hollie-May Saker was also present along with Women Direct's Pritika Swarup whose alluring mix of Indian and British heritage fits perfectly in sync with the Spring/Summer 2014 season's multi-hued runway aesthetic. Australian ingenue Maddison Brown and Alexander Wang's current fave Dutchie Tessa Bennenbroek also climbed the stairway in the hopes of being considered for blue chip clients including Vogue Italia, Interview, Dazed & Confused, American Vogue, and W. The biggest surprise amongst this select group of casting hopefuls was Wilhelmina's twenty-one year old Indiana native Clark Bockelman who was discovered by photographer Bruce Weber and recently opened and closed Clavin Klein's Spring/Summer 2014 show.